The yearly battle between Sioux Falls and Mankato has become a matchup of the two best NSIC South squads with the winner better positioning themselves for the playoffs. The schools have met six times with the Mavericks winning all but in 2016 when the Cougars went unbeaten and earned the league title. This year doesn’t quite have the high stakes of the recent past. USF is still playing for an outside chance at the postseason (Mineral Water Bowl) and MSU is the #1 team on the D2 landscape with an eye on home field advantage in the playoffs. After doing some digging, it’s apparent USF is a little more dangerous than a 6-3 record would suggest and MSU is starting to peak at the right time. USF might also be peaking as well. The Cougars are coming off blowout wins over Moorhead and UIU, neither being pushovers for the rest of the league. Running Back Gabe Watson is having a monster season leading D2 with 1702 yards rushing and 23 scores. Watson has gone over 100 yards in all 9 games this year, averaging 8 yards per tote. It will be very interesting to see if he can reach that mark against a MSU defense allowing a near league best 77 yards per game on the ground. In large part to Watson, the Cougars average an NSIC best 492 yards offensively. Watson and the Cougar offense will need a solid passing game if they’re hoping to upset the top-rated Mavericks on the road. A year ago, USF surprised Mankato by coming out throwing (much different than the ’17 Coo’s identity). I expect USF to inject a bit more passing down the field this time around as well as the Mavs perceived defensive weak spot is the secondary. The numbers show though MSU has looked much better against the pass of late. Easy to do when they allowed over 500 yards in the air to Augustana in week two. USF Quarterback Caden Walters is second in the conference in passing efficiency behind MSU’s Ryan Schlichte. Walters hasn’t thrown the ball a lot this fall, averaging just under 20 attempts per contest, but he has completed 66% of his passes. The MSU offense produces the most points in the NSIC at 46 per game. The Mavs have shown fantastic balance in averaging 246 yards on the ground and 237 yards through the air. The Mankato offense is driven by All American Running Back Nate Gunn. After leading the NSIC in rushing last year, Gunn trails Watson by more than 700 yards but is still on-pace to break 1,000 yards. He’s also scored 15 times but just hasn’t had a lot of explosive runs. Gunn’s longest this season is 40 yards (compared to Watson who has 6 of more than 50 yards). Gunn remains a fantastic weapon for the Mavs between the tackles and is the key component to the offense. Something tells me the Mavs running attack is going to look to prove that Gunn is still the top runner in the conference, versus the newcomer Watson. Given how productive both backs have been, it'll be interesting to see how the match-up shakes out. The Mavs have the best pass-catching option in the NSIC with 6’5 wideout Shane Zylstra, who leads the NSIC in touchdowns receptions with 11 and in yards per catch at 19. Zylstra has scored every week of the season and will be a major concern for the USF defense. The Cougars struggled with him a year ago when he broke their back with two scores in the last 5 minutes in the Mavs comeback 27-23 win. It’ll be interesting to see if USF tries to match-up tall sophomore corner Hakeem Johnson (6’3) on Zylstra in an attempt to neutralize the 50/50 balls. It’s hard to think Zylstra could draw man coverage given his ability and body control for such a big target. The Mavs have also done a nice job of incorporating their other wideouts in the jet sweep part of their attack, becoming dangerous threats to gain chunk yardage. Typically, USF and Mankato are two of the better defenses in the conference but haven’t been quite as “shut down” as years past. The Mavs have showed signs of getting there over the past month, led in large part to a pass rush which leads the conference with 40 sacks. On the flipside, not getting pressure upfront is probably the biggest difference for this year’s Cougar defense. USF only has 15 sacks, near the bottom of the NSIC. Both squads do well against the run and have similar pass defense numbers. The Mavs and Cougars have similar makeups but also some key differences. Mankato has a go-to weapon in the passing game with Zylstra. Nate Johnson was that guy for USF but went down with a leg injury 2 weeks ago at Moorhead. Mike Maxwell is a smaller wideout that can be dangerous for the Coo, but doesn't quite offer the home run threat Johnson was. The Mavs boast All-American Kicker/Punter Casey Bednarski, a weapon anytime the Mavs get past midfield. USF’s Sophomore Mason Laramie booted two field goals last week against UIU but is just 5-10 for the year and has missed 5 extra-points. USF should be a strong test for MSU (like they were a year ago) but I’m not sure the Cougars will complete enough big plays in the passing game to pull an upset. If USF can stretch the field, the game changes. The Mavs should get pressure on USF’s QB Caden Walters and disrupt the Cougars attempts to stretch down the field. I’m also expecting the Mavs to somewhat neutralize Gabe Watson, meaning we won’t see an explosive rushing output. USF will likely look to stop the run first putting them at risk to the Mavs improved passing game. I feel the team that makes more plays in the passing game and special teams will win the ballgame. Both have played mid-to-higher level squads competitively until a week ago. WSC lost 55-2 when hosting Mankato and UIU lost 34-7 at USF. Neither game was close. That said, the Peacocks are 2-2 at home, with narrow losses to Augie and Moorhead and big wins over Winona and Bemidji. I will go with the Peacocks as they typically play much better at Harms-Eischeid Stadium. A really tough call. Winona thumped the Vikings a year ago as the season closed out, but Augie has been on a nice run, having won 3 in a row since the UMD setback. WSU has won 4 of 5, the loss also to UMD. The Warriors passing game clicked a week ago against SMSU. Owen Burke completed 21 of 32 for 294 yards and 3 scores. Isaiah Frandsen stepped up with 6 catches for 70 yards and 2 scores. Frandsen is one of the NSIC’s top receivers and someone WSU really counts on. Augie has averaged 47ppg the last 3 weeks. Quarterback Kyle Saddler throws for 300 yards per game. A negative turnover margin has helped keep the Vikings from being stronger than 6-3. The AU defense continues to get better against the run but overall is still middle of the pack at 27ppg allowed. Most of the week I assumed that I’d be landing on Augustana with my pick. The Vikings though are still looking for a win over an opponent that is .500 or better (they’ve lost to MSU, USF, and UMD). Winona might not be quite as strong (at this point of the year) as those mentioned, but I do think the Warrior defense is good enough to disrupt the Augie passing game and prevail. The Battle Axe Trophy is at stake. The Beavers have the trophy now but Moorhead holds an advantage in the longtime series 46-35-3. With Quarterback Jakob Sanani lost to injury two weeks ago, former starter Bryce Meehl has stepped in nicely. Meehl threw for 288 yards and 2 scores in his return to the lineup and rushed for 55 more yards and 2 more trips to the end zone. The Dragon defense allowed 26 points and 306 yards to a Minot State offense that’s struggled mightily. BSU had a nice rebound game after two setbacks, thumping SCSU 37-24 (37-10 heading into the 4th quarter). Alec Ogden played the entire game at quarterback and Andrew Lackowski continued to be a steady threat in the running game rushing for 127 yards on 30 touches with 2 scores. Lackowski isn’t especially explosive but uses patience to get 5 yards per carry and move the chains. He’s 3rd in total rushing yards in the NSIC (trailing Gabe Watson and Nate Gunn) despite missing 2 contests. The BSU defense leads the NSIC with an eye-popping 18 interceptions (6 more than anyone else). They pilfered 4 against SCSU QB Dwayne Lawhorn last week, bringing him down to earth. As much as I like the good things this young Moorhead team has done this year, I think Bemidji State is better, mostly on defense. These two squads want to play different types of games, with BSU liking to mix things up in the interior and Moorhead more comfortable on the perimeter and in-space. I think BSU will dictate the action and retain the Axe. Crookston struggled with Duluth last week generating just 109 yards of offense and 3 first downs. The Eagles only score in a 63-7 loss came on a fumble recovery. Northern State was in a sticky situation in Bismarck, chasing the score all afternoon against the winless Marauders. With 6 minutes left the Wolves took the lead on an 81-yard score through the middle of the Mary defense. Despite escaping with the win, it’s a concern they were outplayed by Mary for 54 minutes. Playing through injury, QB Hunter Trautman was able to get the Wolves a win. Assuming Trautman is healthy enough to play at home against UMC, the Wolves should have a better showing. SMSU gave Winona its best shot a week ago coming back to tie things at 16 midway through the second half. The Warriors outscored the Mustangs 22-10 the rest of the way to secure a comfortable win. This shows me SMSU is not far away from the 6-3 type squads but the Mustangs need to learn how to finish. Wideout Daniel Davis is the receiving yards leader in the conference with 954 and 9 scores. The Florida native has been past the 100-yard mark in 4 of the last 5 games. The SMSU defense has improved from allowing 500-600 yards a game to decent offenses to limiting Winona to 405 yards last week. Few have noticed but the Mustang defense is middle of the pack this year and near the top of the NSIC with 19 takeaways. CSP just hasn’t looked good since early September. The offense has struggled to the point that Quarterback Dom McKinzy may be out of a job. McKinzy was replaced by former starter Maxon Hutton in last week’s Augie loss. He was just 9 for 19 and ineffective in the zone-read running game. McKinzy has completed only 42% of his passes during Concordia’s last 3 games. Pair that with a struggling CSP defense and suddenly the Golden Bears have faded from the glow they had the opening month of ’18 (though they are not quite as bad as they were a year ago). With the team’s trajectories running counter, I greatly favor SMSU and expect the Mustangs to push toward a winning campaign after a lost 2017. 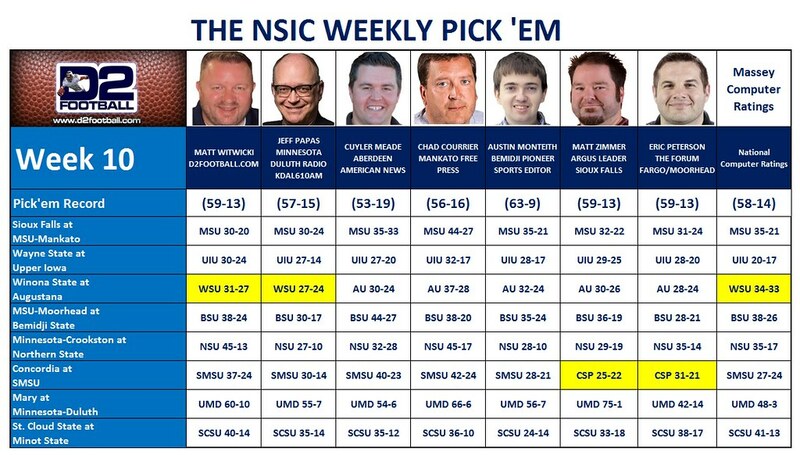 Your fearless NSIC Columnist picked the Marauders to upset Northern a week ago. Mary toyed with me, leading until the end when it reverted back to the same old same old. UMD is firing on all cylinders even after replacing the starting quarterback and a wideout. The Bulldogs just might be the best squad in the conference. It’s too bad they don’t face Mankato in a winner take all match. Maybe in the playoffs. SCSU may have fallen out of the playoff race with a one-sided loss to BSU last Saturday. The Huskies are 6-3 but I don’t see them being as strong as the five other 6-3 squads in the NSIC. They beat USF but week in and week out look more like a .500 team than one playing for a postseason opportunity. All three of the Huskies losses have been blowouts and they’ve allowed more points than they’ve scored. Odd stats for a team having a good year. Minot State lost its 6th straight but did compete better at Moorhead and looked better than in many a game. Running Back Lane Torgerson scampered for 224 yards on 11 touches and a score. St. Cloud should handle 1 win Minot easily. Look for Quarterback Dwayne Lawhorn to rebound from last week’s four interception outing and running back Gregory Lewis to have a big day as well. Another great column, Witt! I wish you would have been able to come to MSU tomorrow.